Experience Bright from the Top Deck. Uninterrupted views from every room. Top Deck offers the ideal place to getaway with a group, especially two or three families. Spacious multi-level living gives families the space to spread out, but still catch up with a supplied board game around the table. Perhaps a battle on one of the many games machines is more your style? The kids will be love the lower level hang-out area with big screen television and sunny deck – all for them. 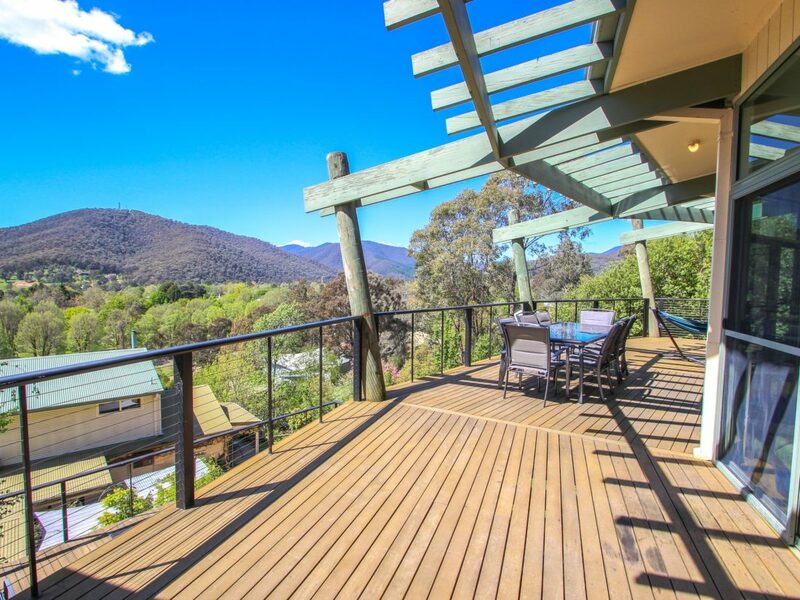 Relax by the wood fire or watch the sunset behind the mountains on the sprawling deck. Two dining areas means everyone can enjoy a home-made feast in your fully equipped kitchen. Enjoy a barbecue on the deck or head just down the road to amazing restaurants and cafes. In the cooler months dine at the indoor table to enjoy the views, or snuggle on the big comfy couches and make the most of the games machines, DVDs or extensive library. Four spacious bedrooms offer plenty of space perfect for families. The master bedroom with open ensuite leads out to the deck and offers a queen bed with all linen supplied. The second bedroom, also with a queen bed has a television and access to an open ensuite with bath. The third bedroom has two single bunks (four beds) with bedding supplied but you provide sheets, towels and pillow cases. The fourt bedroom with access to the deck has a Double bed (with linen provided) and single bunk (BYO linen). Downstairs is where the magic happens. A spacious kids zone with big screen television with XBOX and their own deck to hang out. Downstairs you will also find a fully equipped laundry and enclosed yard area.